What is HappyFox Ticket details? HappyFox Ticket Details is a field available under each Chat Transcript, located below the Tags field, under History Tab in HappyFox Chat. Who has the access to HappyFox Ticket details? Admin(s) as well as Agent(s) has the access to HappyFox Ticket Details. Which plan has HappyFox Ticket details? All plans have access to HappyFox Ticket details, provided, that particular HappyFox Chat account has to be integrated with HappyFox HelpDesk to view the HappyFox Ticket details. Ticket ID - The Chat Transcript will be created as a ticket in HappyFox HelpDesk, whose ID will be displayed here. Ticket ID is a hyperlink which on being clicked, will be directed to the particular ticket in HappyFox HelpDesk. 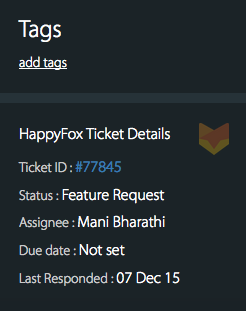 Status - Status of the Ticket in HappyFox HelpDesk. Assignee - The staff/agent to whom the ticket is assigned to, in HappyFox HelpDesk. Due Date - Due Date for that ticket in HappyFox HelpDesk. Last Responded - The Time/Day on, when there was a last response that was being sent to the customer from the staff, in HappyFox HelpDesk.